Videos have become so common in business marketing that they often impact customers’ buying behavior. Four times as many consumers would rather watch a video about a product than read about it. Seventy-one percent of consumers who viewed a video ended up making a purchase. 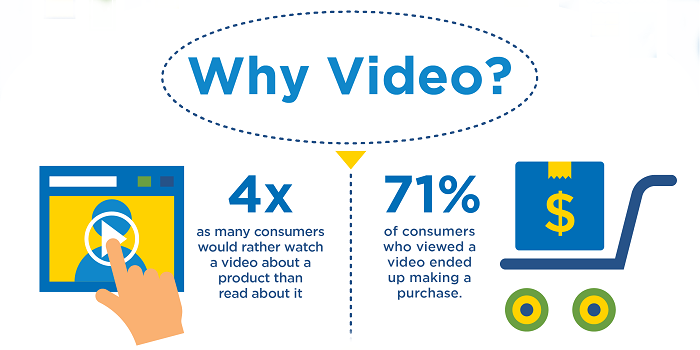 Download our latest infographic for more statistics on the success of video marketing. What kind of videos should you create? Explainers, product demos, how-to’s and testimonials are the most common videos. How long should they be? Videos less than 90 seconds keep 53% of viewers compared to those over 30 minutes that retain only 10%. Where to post them? Websites and social channels are the most common distribution channels.